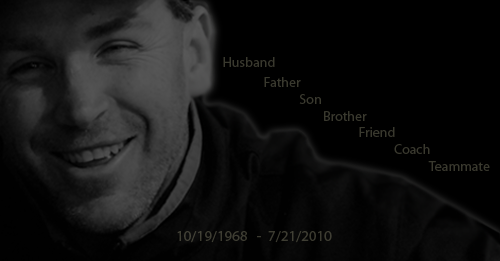 The Golden Wolves Hockey Family lost our dear Rob Kenny in a tragic car accident on Wednesday, July 21, 2010. As we all cope with this great loss, we have a bigger challenge, to help Rob's family get through this most difficult time. Rob left behind his lovely wife Janelle and three beautiful young children. 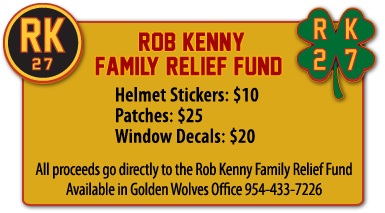 We are extremely appreciative of teh outpouring of sympathy and prayers for the family, but we must ask that everyone in the Florida Hockey Community open their pocketbooks and make a donation to the Rob Kenny Relief Fund. Rob has given so much of his time, talent, heart and affection to so many as a coach, mentor, friend and loving husband and father. It's time for us to give back to help this family that we love so much get back on their feet and carry on with their lives as Rob would have wanted. In the spirit that Rob preached and lived by, it's time for the Golden Wolves Team to do what we do best, succeed as a team. Unfortunately, we cannot accept credit card donations at this time. Kenny, Robert J., 41, of Weston, passed away Wednesday, July 21, 2010, in a tragic automobile accident. Born in the Bronx, Rob started his hockey career at the age of eight years old playing at the Sport-o-Rama. His parents Mike and Toni supported Rob's hockey dreams from an early age. He went on to play high school hockey at Don Bosco in New Jersey and continued on to the USHL with the Waterloo Blackhawks. His perseverance led him to play hockey on a full hockey scholarship for Northeastern University in Boston. Rob continued with the team as Assistant Captain of the Division 1 school and was awarded the MVP and invited to tryout from amongst the top 60 amateur players in the country for the 1990 United States Olympic team. He signed as a free agent with the New York Rangers and played for three years in their organization. Additionally, Rob played for the Long Beach Ice Dogs and the Orlando Solar Bears both of the IHL. He was also a player assistant coach with the ECHL Miami Matadors, and a player and coach for the London Knights. He was a spokesperson for many charitable events including the Smoke Free Campaign with the Rangers and was the booster player of the year for three years with the Rangers. For the past ten years, Rob coached youth hockey at Pembroke Pines Ice Arena with the Golden Wolves hockey club taking several teams to both National and State finals. In his recent years, Rob was a co-owner and founder of the Pinnacle Hockey group. While playing in Long Beach Robby met his wife Janelle and they were married June 26th, 1998, in Southern California. Rob and his wife moved to South Florida and had their first son Ryan in 1999. 12 days after Ryan was born, Rob was asked to play for the London Knights in England. The family moved to London and spent one year playing abroad. IN 2002, their second son Sean was born and in 2005, their daughter Ella joined the family. Rob was a devoted husband and father, son, brother, teammate, coach, and friend who spent every moment possible with his family & friends. He is also survived by his loving mother, Antoinette, brother Michael Kenny; nieces Antoinette, Anna Maria, Ashlynn, & Kinsey; nephews Evan & Konnor; mother & father-in-law Jill and Karl Parsons; brothers-in-law Kaleb (Kristine), Konrad (Shannon) Parsons & Robert McLogan; & sister-in-law Stephanie Ferry (Robert. )His extended hockey family, from the organizations he played in to his current Golden Wolves hockey family, and all the lives he touched along the way, meant the world to him. Visitation will be Sunday from 2 - 4 PM & 6 - 8 PM at the funeral home with a Tributes of a Lifetime Service beginning at 7 PM. Funeral Mass will be Monday, 11 AM, at Assumption Catholic Church, 2001 S. Ocean Blvd., Lauderdale-by-the-Sea, FL. In lieu of flowers memorial donations may be sent to the Rob Kenny Family Relief Fund, Pines Ice Arena, 12425 Taft Street, Pembroke Pines, FL 33028.